Research shows that senior citizens are among the fasted growing segment on Facebook. 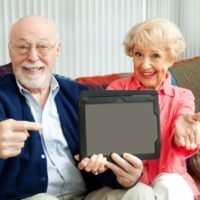 This makes sense because social media sites like Facebook allow seniors to keep in touch with friends and family across the miles. Using social media also provides an opportunity for interaction with their favorite brands or television shows. Web chatting sites such as Skype or Google Hangouts also provide face-to-face interaction as a way to truly stay connected to friends and family. Posted on: June 23, 2018.